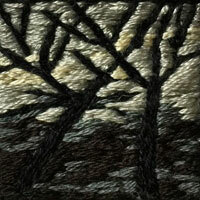 This page presents projects related to Lynn's fiber artworks. Following the publication of her verse novel, Moon Sea Crossing (Black Moss Press, 2005), Lynn began to explore visual modes of poetic expression. Initial experiments with textiles ignited an obsession with embroidery, which soon became the focus of her artistic practice. Oblique Poetries is a collaborative wordsoundart project of Lynn and Scott M2. 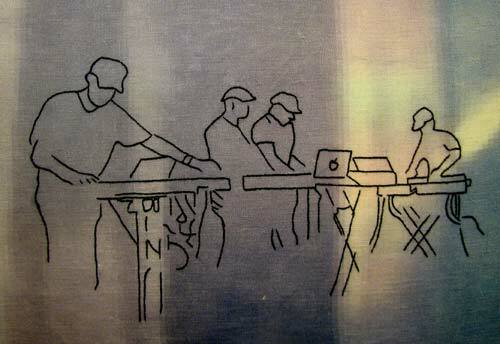 Rooted in their poetry - multi-media projects developed combining words, music, paintings, photography, video and fiberart. Join Lynn's e-mail list to be notified about upcoming openings, events, publications, readings or releases. 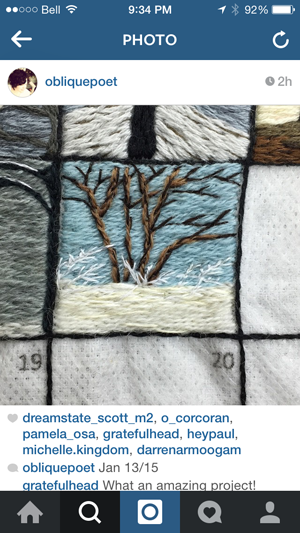 The Calendar Project 2015 was an ambitious project to inspire and enforce creativity by designing a new piece of fiber art daily within the cells of 12 calendars and to post them to her Instagram account for the entire year of 2015. Inspired by the everchanging view from her home and from her travels, the project served as Lynn's diary and sketchbook for capturing ideas and the changes of the seasons. 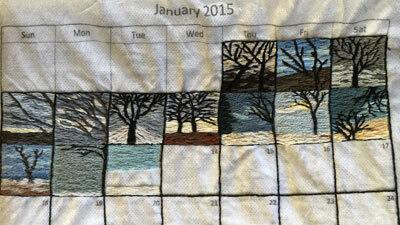 Read two in-depth interviews with Lynn about the Calendar Project 2015 by Olisa at mr x stitch. At the halfway point of the Calendar Project Lynn was interviewed by Floresita at Feeling Stitchy. Aqua Reliquia is an ongoing multimedia project by Lynn Harrigan and Scott M2 combining fiber art, poetry, video, and electronic soundscapes inspired by the Great Lakes region. 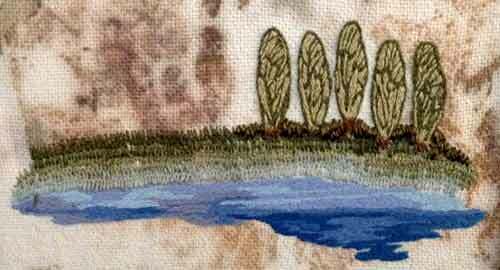 Aqua Reliquia - Waterlines focuses on water and shorelines and features Lynn's hand embroidered images plus Scott's ambient video piece Waterlines. Aqua Reliquia 1913 is a meditation on The Great Lakes and The Great Storm of 1913. Taking place on the one hundredth anniversary of the storm, Aqua Reliquia will feature Lynn Harrigan's fiber art and poetry plus the video art of Scott M2 and electronic soundscapes by dreamSTATE. Please follow Lynn's Aqua Reliquia Facebook page or her Tumblr page for insights, details and updates on the installation, the Lakes, and the history of The Great Storm of 1913 aka The White Hurricane - which sank 19 ships and killed over 240 people on the Great Lakes at its peak. The Opening reception for Aqua Reliquia will take place on Saturday, November 2, 2013 at Gallery 1313, 1313A Queen St. W., Toronto, 4–7pm and will feature a live performance by dreamSTATE. There will be a closing event on November 9th, one hundred years after the peak of the storm, featuring a dramatically different concert by dreamSTATE. The newly completed series Scenes from the Drone Cycle 2012 will be exhibited at Supermarket, where the Drone Cycle music-series was held, and will feature all of Lynn's art from the monthly concerts, January through December 2012. Complete notes for this series are found below with the August 2012 exhibition of the first half - SCENES FROM THE DRONE CYCLE 2012 - Part 1. This portrait of electronic music producer Byron Kent Wong will be presented as part of the SQUARE project curated by Francesca Agostinelli for Taukey Edizioni Musicali - Teatro San Giorgio - Udine, Italy. The piece is a chapter from the series Scenes from the Drone Cycle 2012. Complete notes for the series follow. My partner Scott M2 is an ambient musician and founder of the band dreamSTATE. 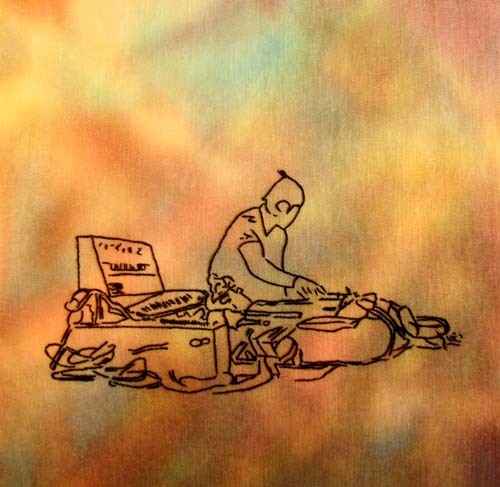 His musical focus over the past year has been dreamSTATE's Drone Cycle 2012, a year-long cycle of live ambient music creation with monthly special guest sound-artists. Privy to the behind-the-scenes preparations, I have watched the extensive thought, discussion, collaboration and relentless sound-design involved as each new guest artist brought their personal identity to the soundweave. I wanted to celebrate and visually document this ambitious series with a slow-art process that parallels the slow-sound ambient music design and accompanying amorphous light paintings by General Chaos Visuals (Stephen Lindsey and Eric Siegerman). 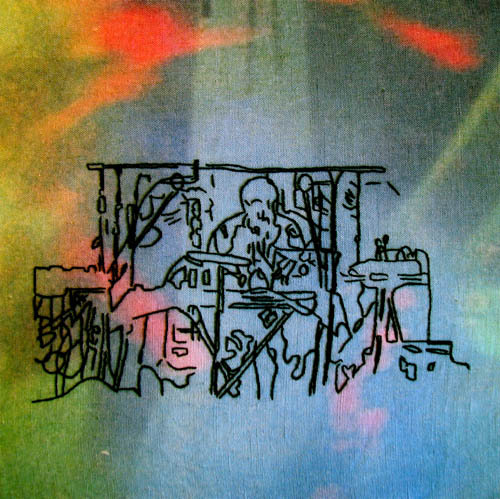 As the musicians created their soundscapes using vintage analogue synthesizers, various stringed instruments and modern state-of-the-art digital "virtual" instruments, I employed mixed-media techniques blending artistic practises ancient and ultra-modern. The pure analogue light projections were captured with digital photography and printed on traditional ecclesiastical Irish linen mordanted with Tara root extract and alum. Digital images of the musicians taken by various photographers were selected to represent each concert and transformed into raw outlines using a variety of iPad apps. 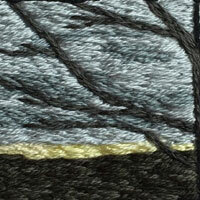 The heart of each image was then drawn onto the linen and hand-stitched with single-strand DMC cotton floss. This exhibition represents impressions from the first half of the Drone Cycle series - hosted by Supermarket - 268 Augusta Avenue Toronto - August 11th through 17th, 2012. Many Creationists have a powerful need to cleave to a literal reading of the Bible. They have concluded that, since the universe was purportedly created in a single week, fossil evidence of the evolution of life is actually an elaborate trick designed by God to test their faith. Scientific proof of a past before recorded history is trumped by their longing for a future beyond death. Their creative interpretation of the world has evolved from a need for certainty expounded by literal interpretations of the Word. Fascinated with the strange and beautiful variations of evidence that have survived over millions of years, the artist also takes liberties with truth, colouring her perceptions to assuage her own desires. Evidence presents a series of three-dimensional trilobite fossils suspended in time and space. Each trilobite is hand-embroidered on eco-printed silk and wool which is then sewn into the shape of rocks. Just as imagination requires the suspension of disbelief, faith in the beauty of truth is embodied by this suspended Evidence. Lynn's contribution to the 2011 edition of AWOL Gallery's Square Foot project. The Aradus Variations presents a species of the flat bug family that is native to the Great Lakes region, the Aradus robustus. The robustus feeds on fungi found under the bark of dead oak trees and logs. This explains their incredibly flattened bodies. 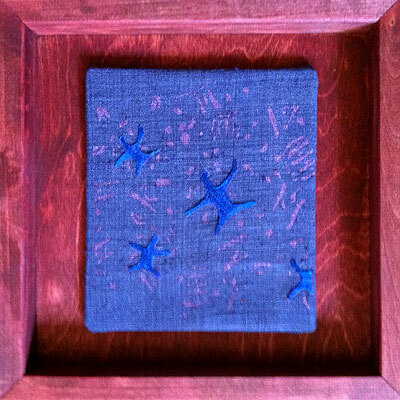 Hand embroidered, each variation becomes a canvas for moods and feelings evoked by the Great Lakes. 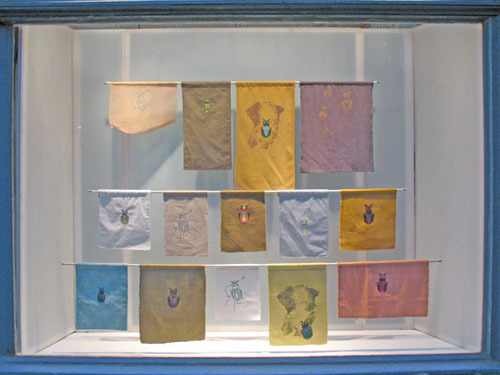 Cotton prints and tussah silk coloured with natural dyestuffs create the ground for these stitched flat bugs. Screen printed patterns and images add another design element. In this way, colour, line and texture transform the regions ecosystem into a sensuous exploration of place and timelessness. 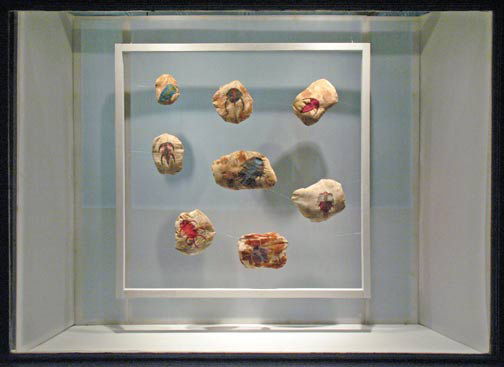 The Aradus Variations (2010) is a part of Aqua Reliquia, a multi-media installation that combines poetry, textiles, and soundscapes to evoke the character of the Great Lakes region. The project was inspired by stories about the Great Storm of 1913, the worst natural disaster to ever occur on the Great Lakes, and has led to an obsession with all aspects of the region. Click here for a short slide show. 984 Queen St. W. Toronto. Three fiber-art pieces from Lynn's Field Guide to Longing series will be appearing as part of the OBSCURED METROPOLIS exhibition. 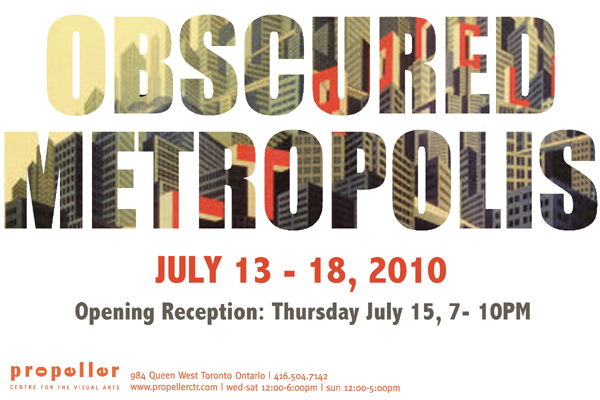 Opening Reception: Thursday July 15th, 7-10pm. 1313A Queen St. West, Toronto. An Oblique Poetries wordsoundart piece created with ambient multimedia artist Scott M2. 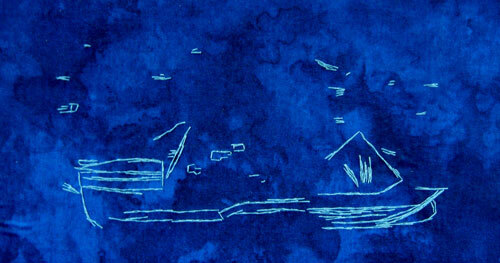 Poetry, ambient video painting and hand-embroidered silk. Rain of Fire marks the first installment of Intersections, a three part series curated by Simone Rojas-Pick and Jessica Nagy for the Launch Pad Project for the Gallery 1313 Window Gallery - 1313A Queen St. West, Toronto. Opening Reception: Thursday May 13th, 7-10pm. 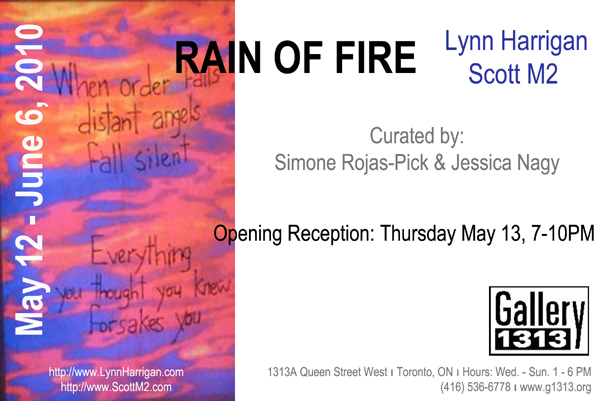 "Rain of Fire is a new multimedia collaboration between Scott M2 and Lynn Harrigan that combines poetry, embroidery and ambient video painting to address the vulnerability of so many during these times of rapid economic change. Created as part of their developing Oblique Poetries series, the piece reflects the emotions of people trapped by the economic collapse of recent times and the false promises of the global new world order. Left exposed and unprotected, there is no solace in the gospels of greed."